Good sound · Good song · Good performance … …. 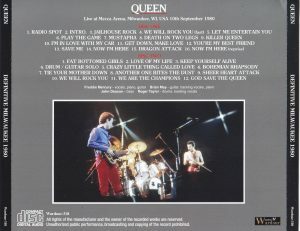 A masterpiece live album that depicts “One Giant TOUR” of one big prime minister with triple play. It is a permanent preservation press appeared in 2CD. 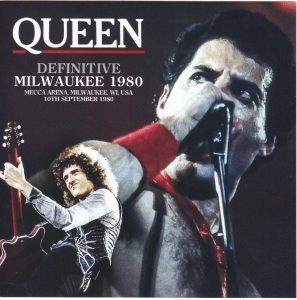 It is contained in such a work “Milwaukee performance on September 10, 1980”. It’s that superb audience recording. In addition to the official work “QUEEN ROCK MONTREAL” from “THE GAME TOUR”, we have also introduced our masterpiece live album such as “DEFINITIVE CHICAGO 1980 (Wardour-313)” and “WEMBLEY ARENA 1980 1ST NIGHT (Wardour-308)” It was. Even in the sense of organizing the collection, let’s first check the position of the show from “THE GAME TOUR 1980” of the great prime. This is the world tour of QUEEN prosperity. 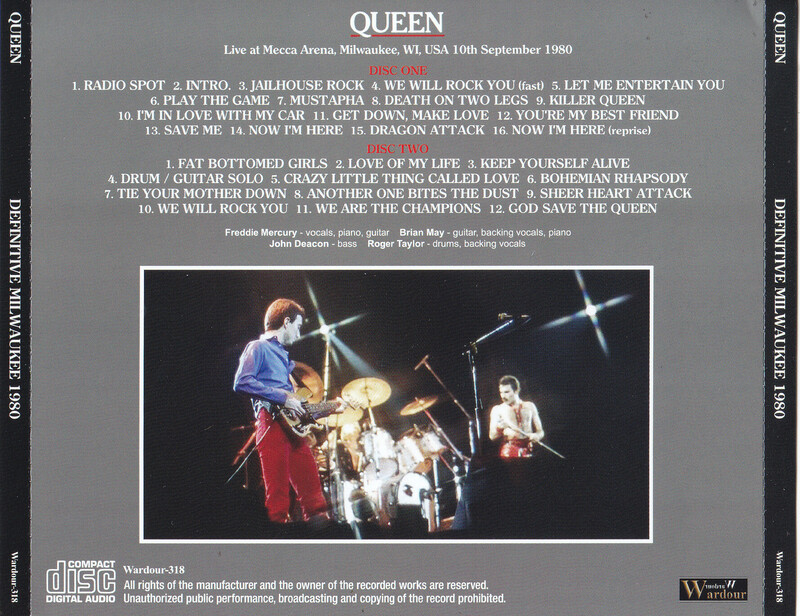 “QUEEN ROCK MONTREAL” is “North America # 3” on the final board, “WEMBLEY ARENA 1980 1ST NIGHT” is “Europe” leg. In contrast, the Milwaukee performance of this work is “North America # 2” before the release of “FLASH GORDON”. It was a concert of 21 concerts. This is the most recently released “DEFINITIVE CHICAGO 1980” in the middle of popularity. 6 Before the performance. This work, which recorded such a show, is a superb audience recording representing the prime “THE GAME TOUR” North American leg. It is one that brushed up the name board ‘IT’ S A KILLER ‘. Speaking of “IT’S A KILLER”, the radio show on Milwaukee show on the same day was also a big impression that was a huge impact. Although it is recorded also in this work, although it plays on the representative song collage of QUEEN when it plays, publicity begins, but that nori is tremendous and exciting. “On Wednesday night, an unforgettable rock experience will come … This year’s big event, QUEEN’s concert! QUEEN …… Dynamic Freddie Mercury.QUEEN … Rock’n’Roll Stage Productions. ! (So the title was “IT ‘S A KILLER”). It is the spectacular spectacle CM of the movie “FLASH” theater predictive, as if to dress with Dos’s shibuya. Of course, that CM is absolutely bonus. The real dread is (perhaps) the show itself. This sound is also overwhelming. “DEFINITIVE CHICAGO 1980” was also wonderful, but this work is not losing at all either. Chicago is a half step wise at neatness, but the strength of this work is the strength of the on-core. Although the audience likeness is engraved in the tone color, the straight ball arrives straight, the solid spirit feeling is also excellent. There is little venue acoustics, and a huge cheer also does not come in between the performance (Naze). The very thick and powerful performance sounds close to the eyes and the eyes. It does not feel uncomfortable even if it continues from the radio CM of the beginning, and that is the name recording of a little radio broadcasting. On top of that a sense of stability is also amazing. If it says powerful recording, it is worrisome about roar and overpeak, but this work does not need that worry. It does not distort, it does not distort, it remains glossy and beautiful even if it rises to Fortessimo. Although its splendor was felt even in “IT’S A KILLER”, this work is an upgrade version which further refined such a masterpiece master. Of course, it is not a crucial sound pressure production, but a meticulous remaster that has precisely analyzed each range and it has a well-balanced balance and three-dimensional feeling is wonderful. For example, tone range balance. In the original sound, the focus was too much on the midrange, and vocal and guitar missing was now, but in this work it unravels and organizes it. As a result, not only vocal & guitar but also whole ensemble is clear. Further stereo balance. 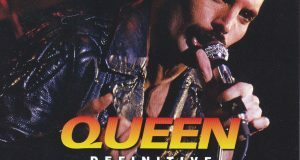 Because of the positional relationship with the field PA, the original sound was a little bit right, but this work can be confronted with QUEEN. Of course, it corrected without missing a momentary sound falling, pitch misadjustment. I pulled out the possibilities of the recording itself and increased the completeness as a live album to the maximum. It is exactly a finished item that is suitable for the name of “Definitive”. A show drawn with such a highest update sound is also overwhelming! After all, Freddie is great and great! Skip to skip and sing without a fake with a powerful voice. It is amazing to do from opening “Jailhouse Rock” and “Let Me Entertain You”. Far from being dangerous, it is a feeling of loud voice as much as you wish to put out, and also singing “Play The Game” which requires high notes without difficulty. 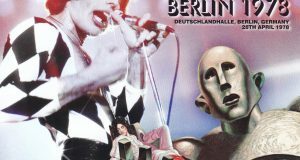 It seems that Freddie himself is satisfied for the first time in its good performance, and “Killer Queen” is freaky to play freely. There is no scary thing so far if Freddie is in perfect condition so far. Three people will heat up so that they will be pulled up and playing up for the first time (I will add it just to be sure, but the pitch is accurate). The middle drum & guitar solo part also performs nearly 10 minutes, and Brian, who always tends to be removed anytime, is almost almost perfect. It’s been a while that I wanted to ask, “Is there something good, too?”, But there are two reasons why I think. One is a schedule. Actually, before this show we had nine days off. Until here, I did a nationwide tour of 34 performances and the band’s engine was driving full power. The holidays entered there, so the condition was perfect. Another reason is the success of single / album. Actually, Brian takes MC in front of “Love Of My Life”, but he said, “I heard about it a while ago, I became No. 1 on the billboard.” Where the mind and body are fully enriched, the report of the national conquest wishing to be a divorce jumped in. It is a great performance where that pleasure explodes. 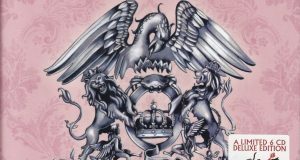 Originally it should be spoken about “Mustapha” “Death On Two Legs” “You’re My Best Friend” “Fat Bottomed Girls” that can not be heard even with “QUEEN ROCK MONTREAL”, but even forget it. Sound upgraded by a name recording representing a great success tour, a great performance that toasts heaven. It is a famous board whose precious music album’s three elements “good sound, good song, good performance” are complete with no more. This is the moment of QUEEN ‘s greatest heyday. Please, please enjoy at anytime with permanent preservation press 2CD anytime.